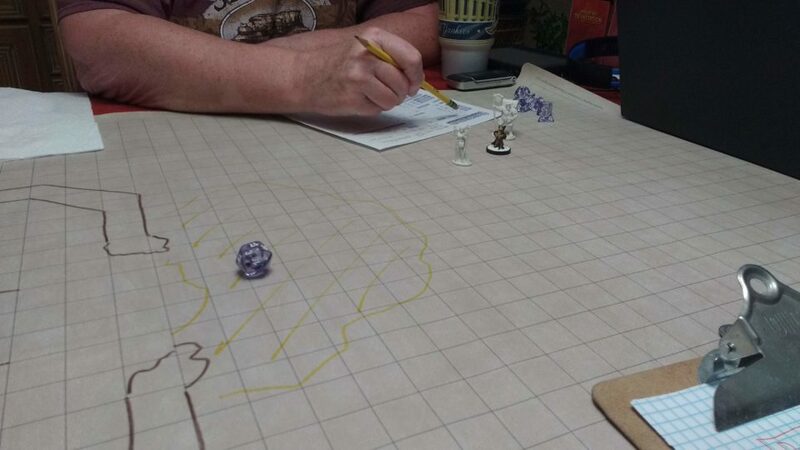 My Dad has been showing a lot of interest in Dungeons and Dragons lately so I decided to run a sitting of Pathfinder for him. I’ve never run an adventure module – always homebrew – but I have a few that I’ve picked up for inspiration. I looked through them and there was the Master of Fallen Fortress – an adventure path for level 1! Perfect. My Dad – referred to as Pop from here on – had an array of character concepts prepared but decided to go with Hamfred Wazo, Halfling Monk. 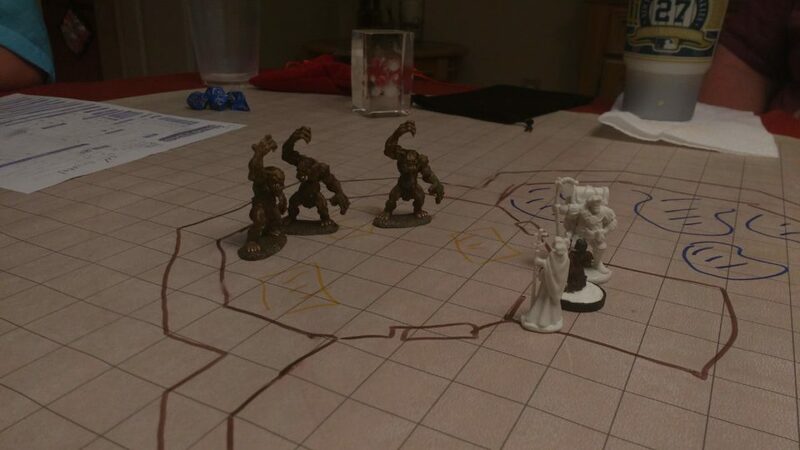 My wife decided to play a Half Orc Barbarian named Deb (she’s currently playing a Dwarf Barbarian in Celestial Winter). 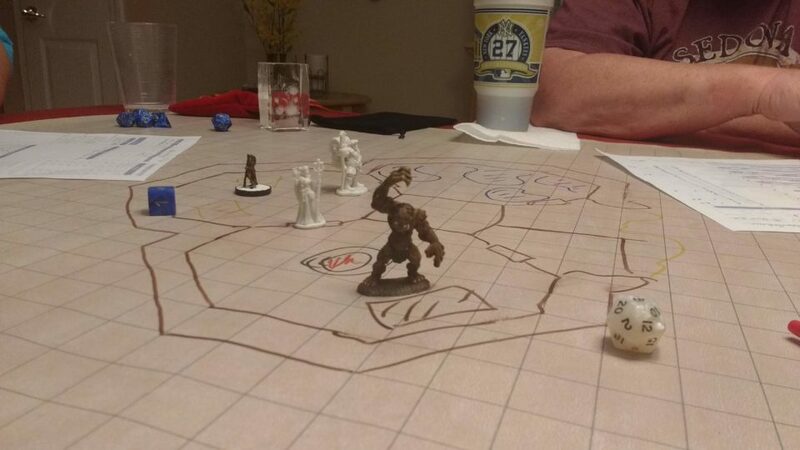 My brother decided to roll for race and class – he ended up as Grub Nub, Half Orc Druid. Pop was surprised at the abundance of Half Orcs and wondered what the other half was? I think he’s ready for Pathfinder Second Edition’s switch from race to ancestry. Hamfred recently lost one of the 17 children and the funeral cost left him in debt. Not willing to further burden his family, he turned instead to Grub Nub and Deb – offering them a proposition to explore one of the siege towers outside of the city which, recently, had been opened by an earthquake. Hamfred kept his debt a secret from his new companions even after they agreed to join him. There were a lot of failed perception rolls on approaching the Fallen Fortress… Grub Nub stopped to taste the soil and noticed something unusual. Hamfred was the one who noticed the pack of hungry dogs approaching the group. He told the Druid to do something about it. Grub Nub managed to persuade three of the four canines to flee… The final canine moved to attacked but was quickly cut down by Deb. Hamfred complained that Grub Nub didn’t 100% finish the task and wondered why he had asked the Druid to come. Crawling over the debris of the fallen walls the intrepid adventurers (minus Grub Nub who lagged behind to skin the fallen dog) entered the ground floor of the Fallen Fortress. Hamfred soon discovered that he had made a rookie mistake… He didn’t bring a light source. The Half Orcs could rely on darkvision but the halfling was effectively blind. Hamfred repeatedly grumbled that the druid didn’t have a spell to help him and wondered why he’d asked him to come. 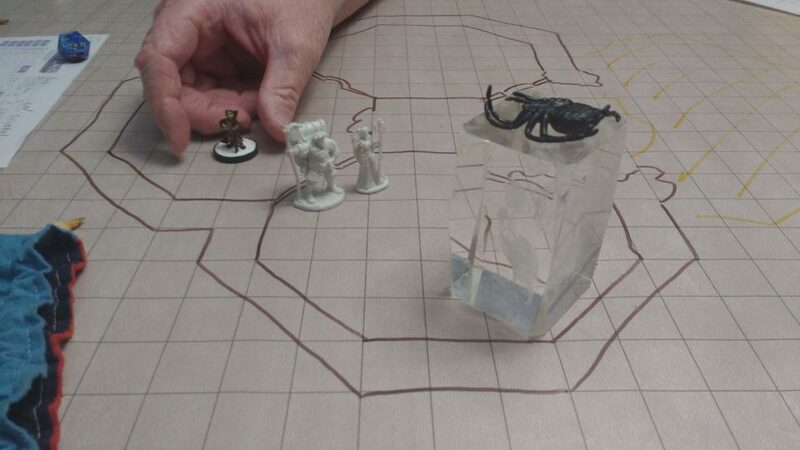 This ends up being an even greater problem when the group is attacked by a giant spider hanging from the ceiling. Grub Nub tries to use his tongue to pull the spider down – his domain power is a supernatural froggy tongue – but instead was pulled into the air by the giant spider due to a very bad roll. Deb crawls up on some debris and leaps at the spider, knocking it to the ground with a broad slash. The two half orcs make short work of the spider once grounded. Finding the central stairs blocked, the group heads back outside to look for a way to climb up. Deb puts together a makeshift torch using a bone and spiderweb for Hamfred. The group was almost immediately attached by a odoriferous reptilian figure – identified as a Troglodyte – and Deb manages to dispatch it with ease. The group also discovers a tiny but friendly lizard in a nearby room. Which ended up being not so friendly after all as it shocked anyone who came close to it. Grub Nub tried to eat it with his magical sticky tongue but that ended up not going well. More Troglodytes rushed up at the sound of combat and the group struggles with them for several rounds. It takes flanking and coordination to finally end their threat. Meanwhile, Grub Nub gets shocked several times before killing the lizard. Exploring further – the group finds an old shrine complete with charred Troglodyte corpses and Flaming Skeletons. 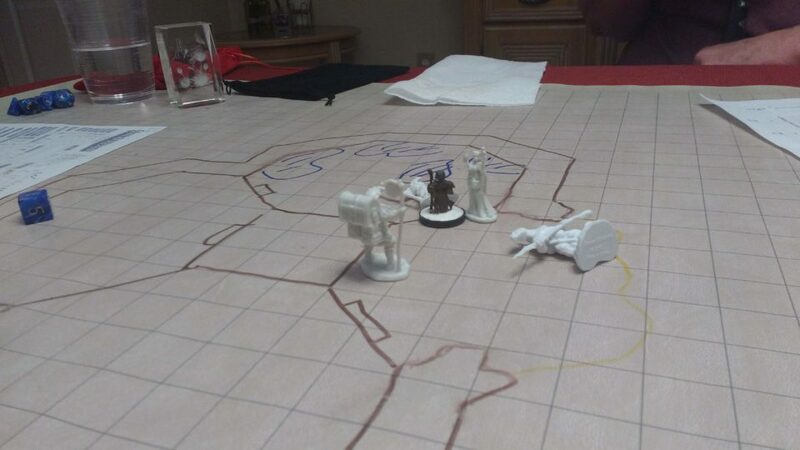 They manage to defeat the undead and loot the shrine but Deb takes heavy damage in the process. Continuing to the higher levels of the Fortress the group discovers the quarters of the Troglodytes (suddenly remembered that I had these painted miniatures). After another lengthy battle they manage to overcome them. To the north is a room with an irate giant frog. Grub Nub, with his unusual devotion to frogs, manages to calm it with wild empathy and make “friends”. 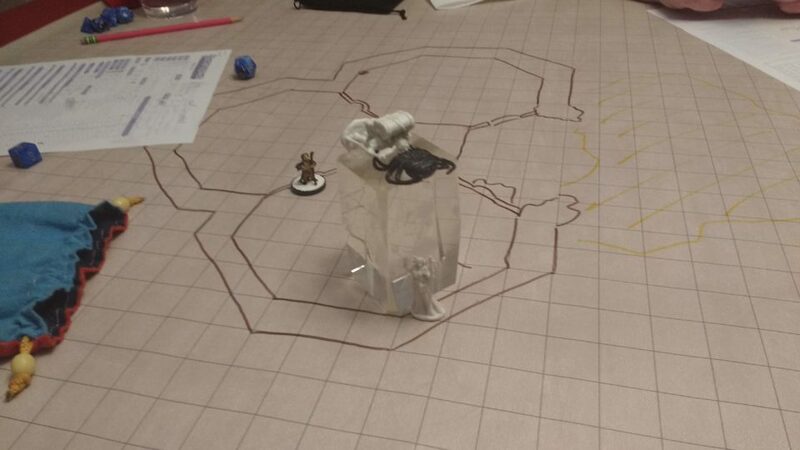 To the south is a room with a brazier, a chest, and a large fearsome looking Troglodyte. The Troglodyte here seems unaware of or indifferent to the sounds of the battle that took place in the quarters. After a long discussion the group agrees on a plan of attack using Grub Nub’s tongue to pull the Troglodyte into the brazier. 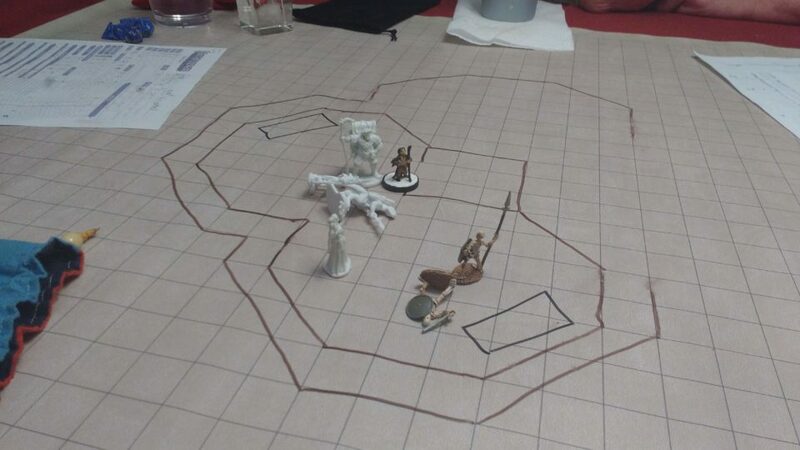 The plan succeeds…but the brazier does very little damage and the fight turns into a slugfest. After this my notes become sparse and there are no more photos. 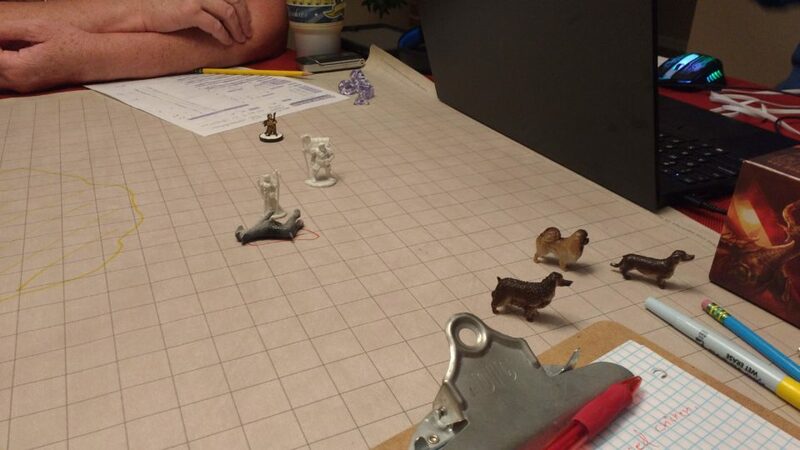 But the group defeated the miniboss – the strong Troglodyte – and freed a captive Bard who happens to be a member of the Pathfinder Society. 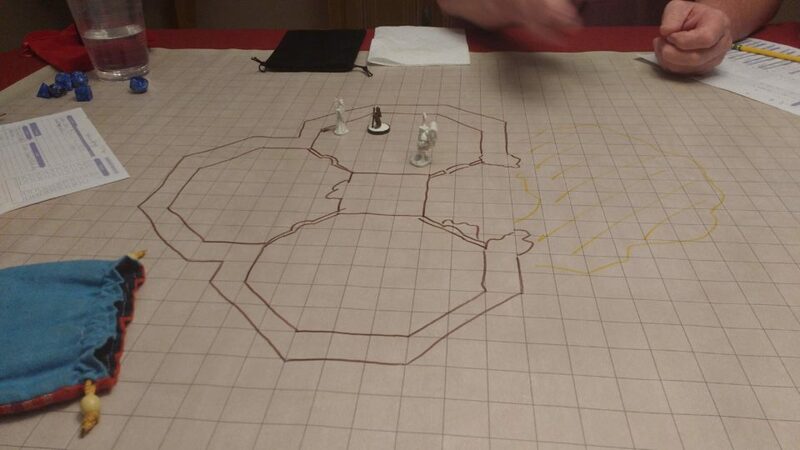 He heals the group up and they then proceed to the top floor to fight a mad Troglodyte Druid. It was an entertaining fight but easy compared to some of the previous ones. 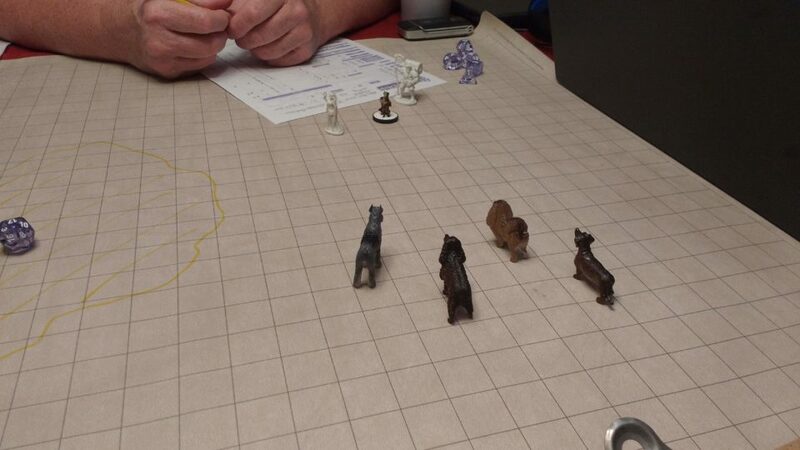 Pop did great at his first tabletop roleplaying session and had a lot of fun. 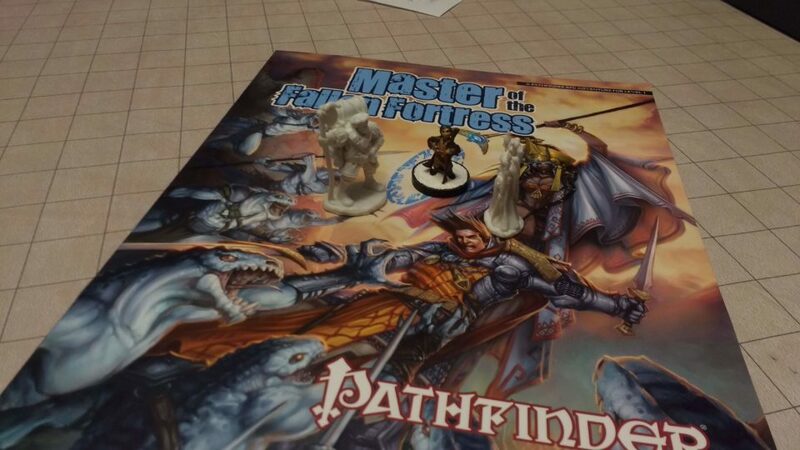 I considered purchasing Rise of the Runelords to run through with him…but now I think I might switch over to the more new player friendly Pathfinder Playtest instead.